My skin isn’t the most perfect out there. Previously, I suffered from severe cystic acne that thankfully went away (except for the occasional cyst occurring once in awhile and of course, some small pimples that I can deal with compared to cysts). But because my skin is sensitive and very acne-prone, including being combination skin with various parts being dry while others very oily, I’m very picky and careful with what products I use in my daily skin care routine. The first step in my skin care routine is to wash my face. I use various cleansers and rotate between three different ones (depending on the condition of my skin that day), so I won’t name them unless you guys want a review about cleansers. After washing my face, I actually don’t dry it with a towel. This is the most important step in keeping your skin hydrated and helping the products absorb into the skin. I keep the skin wet and pat my face to help my skin absorb some of the water. While my face is still wet, I apply one or two quirts of toner in my hands, pat that in the face and while my face is still a bit wet (but not as wet as earlier), I apply two squirts of lotion onto my hands, rub it in my hands to distribute the product evenly in my palms, and pat it into my face. I learned this trick from a video where Miss A‘s Suzy was explaining her skin care routine. She wets her face and while her face is still wet, rubs some skin oil around her palms and pats it into her face to help it absorb. I tried to look for the interview where she talks about this but I can’t find it, but I’m pretty sure it’s her who said it (if not, I apologize and please correct me about it!). After that’s properly absorbed into my skin and it feels nice and supple, I deal with my dry areas (my chin and around my nose, sometimes the area between my eyebrows). If those or any other areas are still a bit dry, I’ll use my ISA KNOX cream. This is my day routine, at night it’s the same except I’ll also use eye cream to help reduce eye bags and prevent any future eye wrinkles. After all that, I use any lip balm I have near me since my lips become dry and chapped easily. 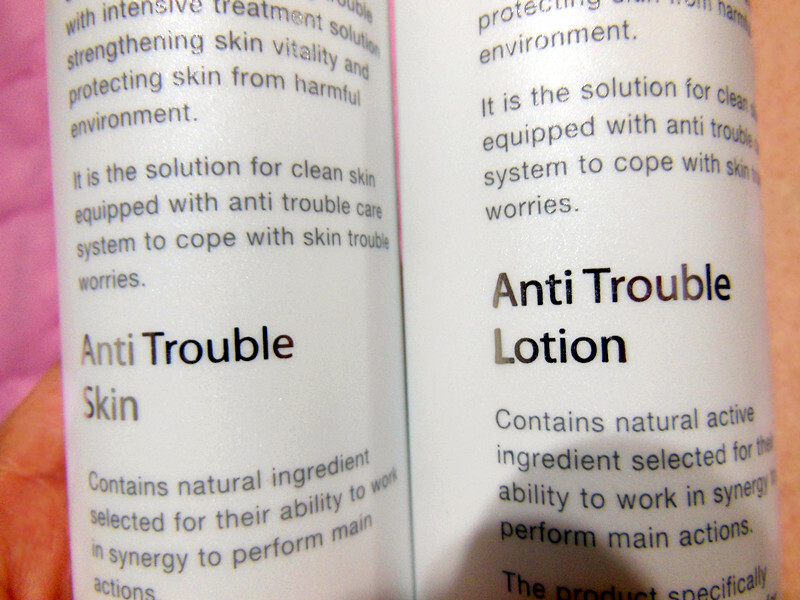 The AC Clinic Anti Trouble toner’s name is technically just “SKIN79 AC Clinic Anti Trouble” but it is a toner since it states so on the back of the product. It’s supposed to be “promptly absorbed without stickiness” and it’s definitely not sticky, but I’ve never experienced stickiness from a toner so it’s odd that they would state that. Anyways, it contains Unshiu Oil, which is extracted from a type of citrus plant, that helps to keep the skin healthy and clean from environmental factors (such as pollution, dust, etc.). This toner also contains Salicylic Acid (although I don’t know what percentage) to prevent any future breakouts. It’s actually very moisturizing, which is surprising for a toner since I usually experience dryness instead of moisture from any toner after it absorbs into the skin. That’s why I like this toner a lot, doesn’t dry me out, is moisturizing, and smells and feels very refreshing. 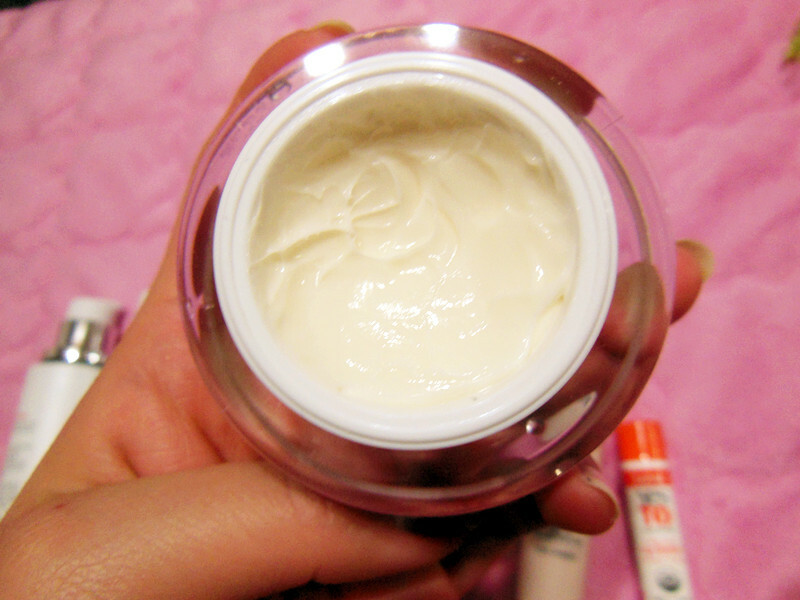 The 2nd product from this line is the SKIN79 AC Clinic Anti Trouble Lotion. This product claims to be a “soothing lotion caring trouble by keeping balance of water and oil” (not the best English, but excusable since this is an Asian product and I like it nonetheless). It’s an oil-free gel-type lotion that also contains Unshiu Oil, Beta Glucan (gives nutrients to the skin and make the skin smoother), and Hyluronic Acid (a natural moisturizer). This product isn’t too thick or oily and actually absorbs into the skin quickly. It takes care of my normal skin areas (my forehead and cheeks), but for my chin and nose, it’s not moisturizing enough so I also use a cream for that area. 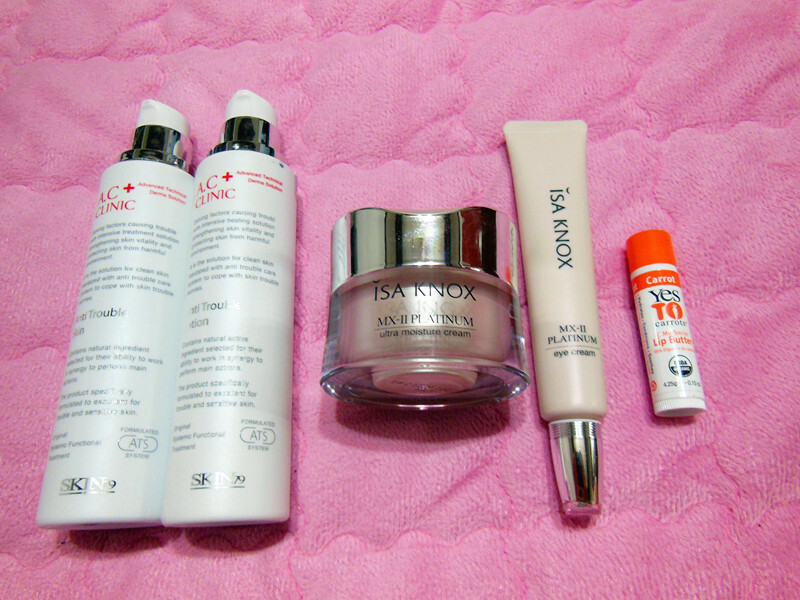 The cream I use is the ISA KNOX MX-II Platinum: Ultra Moisture Cream. Apparently this product is pretty pricey (at least for me, at around $35USD), but my mom is the one who tried this ISA KNOX line, liked it, and bought the set for me to also try out. I also really love it. It smells wonderful (not that is has any artificial fragrances, but that it smells very pure and clean, if that makes sense), and although thicker and oily-ish, it doesn’t break me out. It will sit on top of the skin when first applied, but give it about a minute and it’ll absorb and feels great! Don’t apply too much at once though, or your skin could get too oily or clog your pores. It’s really great for those dry areas that are just too stubborn for normal moisturizers. That was my day routine. 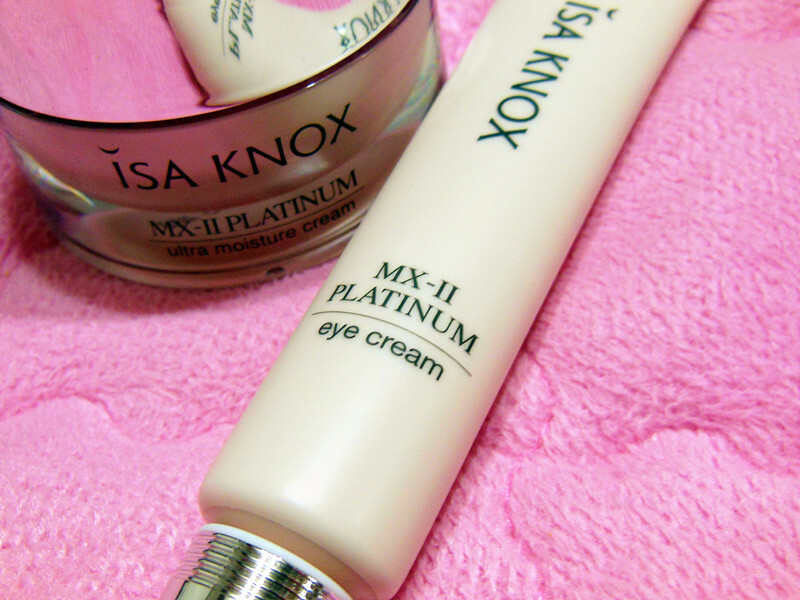 At night, I’ll use the ISA KNOX MX-II Platinum: Eye Cream for my under eye circles and the area near the ends of your eyes that crinkle when you smile (is that called your smile wrinkle area?). I used this cream just for the heck of it since it was sitting in my mom’s beauty product shelf unused, and I have to say I really do see an improvement. My eye bags have greatly diminished and although it doesn’t have any color correction properties, I feel like the color is less purple and prominent than before. I’ve also become a bit paranoid about wrinkles since I’m beginning to reach that age where your skin will start showing signs of aging if not taken care of (I’m 20 years old), so I make sure to use this around my eyes to keep it hydrated and prevent any future wrinkles. I like that this comes in a tube since it’s more sanitary and won’t taint the product as easily (unlike the ultra moisture cream, where it is in a tub). Last but not least, I always apply lip balm to keep my lips hydrated and supple. My lips dry easily whether in hot humid summer weather or in the cold winter months (probably due to my acne pills and birth control), so I always carry and use lip balm. 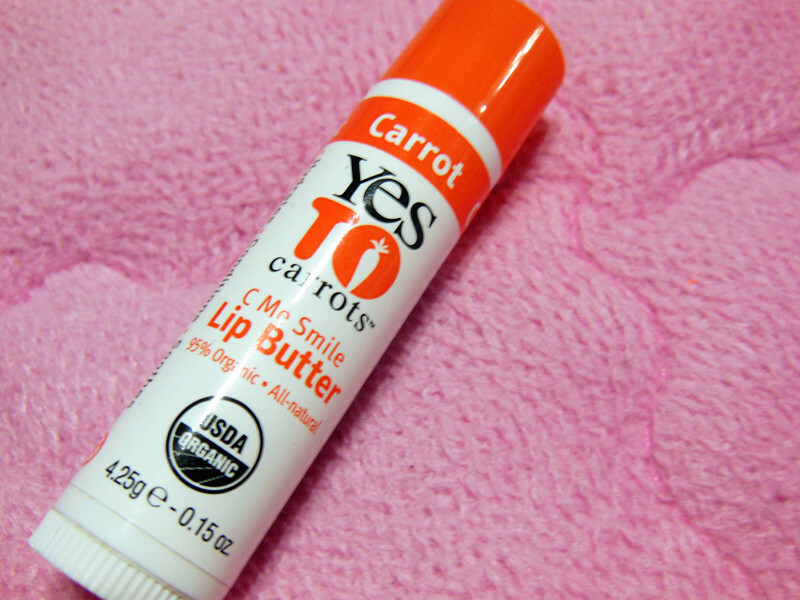 The one I’m currently using and really like is the Yes To Carrots Lip Butter. It has an unfamiliar, almost odd smell but using the product, it’s very moisurizing compared to Chapstick or other cheap lip balm products. I got this on sale at Walgreen’s for $0.99USD, but I think the regular price is $2-$3USD. It’s worth the money (since I’m used to buying $1USD Chapstick). Most lip balms are waxy and just sits on top of my lips, but this one actually absorbs (unless my lips are ultra dry in which it will just sit on top of the dry, cracked skin). I’m not sure if this product is available internationally, but I know the other products can be found online and shipped internationally (although I got mine shipped in Korea through Korean sites). Feel free to leave any comments if you’ve tried any of these products before or have an interest and have any questions about these products. Also, if there are any reviews you’d like me to make (such as about cleansers or other Korean beauty/makeup products).